December's meeting of London's Museums of Health and Medicine introduced those present to a new medical collection in London: the Royal Free Hos pital Pathology Collection. 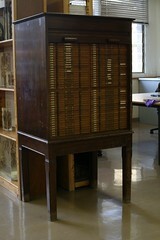 Now part of UCL Museums, the museum contains a variety of collections, mostly medical specimens. Last year, one of the most fascinating collections was on display in the exhibition The Body in Pieces, late nineteenth century plaster casts depicting a variety of bone conditions from the young patients at the Great Ormond Street Hospital. These surreal fragments made an unusual display, and will hopefully be exhibited again. Another exhibit in the small teaching museum (pictured right) proved particularly fascinating from a mental health perspective, however. This old wooden cabinet may not look like much from a distance. Small printed labels on the drawers proclaim it to contain the "RFH Neuro Archive", a description that doesn't seem to do justice to the beautiful objects inside. A recent post addressed the issues around the display of human remains: however, such concerns, while certainly valid, often can't do justice to the objects themselves. 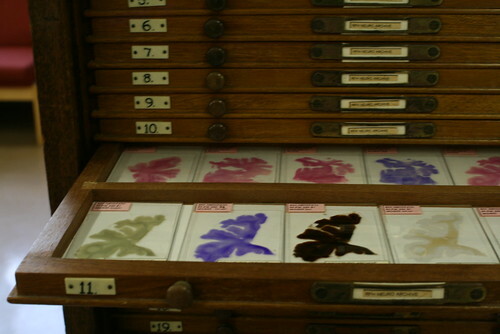 Indeed, on first opening these narrow drawers it is hard to believe that the objects within are specimens at all, for the variety of dyes used turns these feathery brain slices into works of art. Why were so many different colours used? Did they highlight different structures? Did these slides help researchers to understand and explore the human brain? And do they have any meaning now, besides indicating the fascinating artistry of the inside of the human body? Maybe the use of these collections for further teaching and research, both medical and historical, will help to answer some of these questions. Sadly, the slides are not on public display at present. Hopefully, however, some of these objects will find an opportunity for display elsewhere in UCL. For more information on UCL's museums, and to contact staff about research in the Royal Free Hospital collection, visit their website.